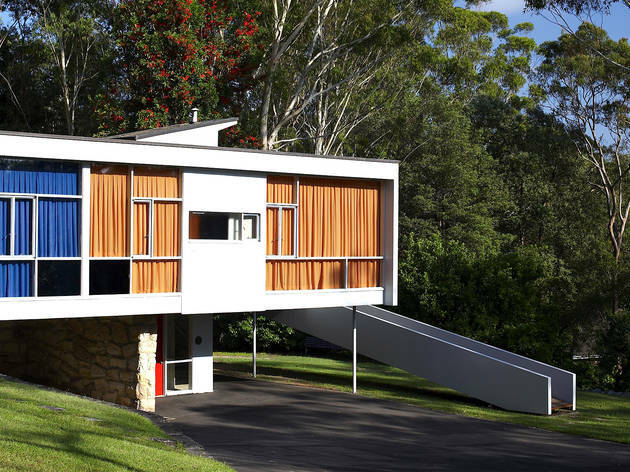 Harry Seidler built this house, his first commission, between 1948 and 1950 for his parents, Rose and Max. The ambitious architect came over from New York, where he had been working for Bauhaus guru Marcel Breuer, specifically to build the house; it was the first local instance of ‘mid-century modern’ domestic architecture. In basic terms, the house is a flat single-storey box resting on a smaller box, with a section cut out to form a sun deck and floor-to-ceiling windows. The open-plan interior is divided into two distinct zones: the living or public areas, and the sleeping or private areas. The original 1950s colour scheme has been restored, and the furnishings are by important post-war designers such as Charles Eames and Eero Saarinen. The kitchen had all mod cons – the very latest refrigerator, stove and dishwasher, plus a waste-disposal unit and exhaust fan – which were then utterly new to Australia and added to the house’s allure locally. 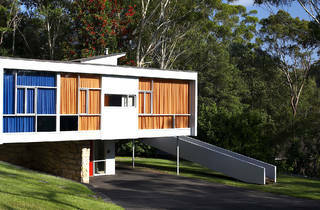 Max and Rose Seidler lived in the house until 1967. It’s now run by Sydney Living Museums, and guided tours are available on request.